lenNY's Yankees - A Bronx Bombers Blog: 13th Featured Yankee Card of the Week! 13th Featured Yankee Card of the Week! 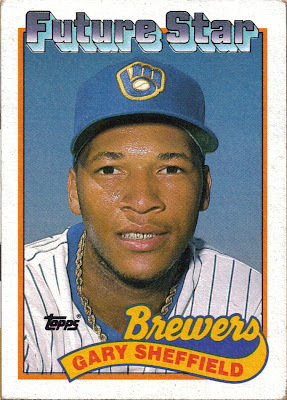 I finally had time to scan some more cards to my computer, and I really liked this card of Gary Sheffield. Sheff is with the Mets now —his eighth team— and is sandwiched between Carlos Beltran and David Wright in the No. 4 spot on a regular basis. The 40-year-old slugger is given a couple days off a week in hopes to keep him healthy all season long. In his three year stint with the Yankees (2004-06), he was extremely productive for the first two seasons, and then sat out most of 2006 with a wrist injury. The Yanks picked up his option for 2007, but then traded him to the Tigers for three prospects: Humberto Sanchez, Kevin Whelan and Anthony Claggett. This card is a 1989 Topps Future Star rookie card. As you can see, the card is not in very good shape (all four corners bent), but is still very cool to see the young Sheff once again. I inherited this card —along with hundreds of others from this era— from my sister.